Offering you a complete choice of products which include Fine Pearl Ring In 92.5 Sterling Silver 4 Astro Purpose, 6 Ct Hasonite Gomedh Ring Made With Silver 4 Astro Use, Awsome Natural 5 ct Red Coral Ring For Astro Purpose In 925, Awsome Turquoise Pendant For Astrological Purpose In Silver, Big Sized Natural Turquoise Ring For Astro Purpose In Sterli and Big Stone Navratna Pendant With 7 Natural Diamonds. 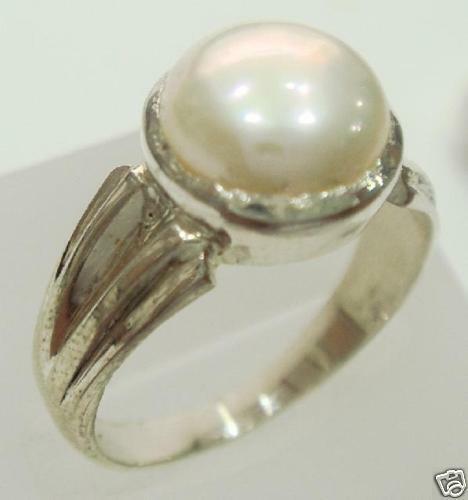 Fine hand carved pearl ring made with 92.5 sterling silver ,fit for astrological purposes. The ring is studed with a fine quality of pearl weight approx 4.00 cts. can wear it for faishon purpose also. Fine handcarved pearl ring made with 92. 5 sterling silver ,it for astrological purposes. The ring is studed with a fine quality of pearl weight approx 4. 00 cts. We ship worldwide and we accept paypal paymentsfrom all our international buyers .We have a verified paypal business account. Very Fine Quality 5 carat Natural Red Coral Ring Made With 92.5 Sterling Silver .The Ring is 100% Fit For Astrological Needs And Ideal For Those Who Are Recomended To Wear Coral Ring. We take Extra Care For Astro Rings So that Stone Touched The Finger To Give its Full Effect And Fulfill Your Purpose . We Ship WorldWide And We Accept Paypal Payments From All Our International Buyers. We Have A Varified Paypal Buiness Account. We Send All Our Shipments Fully Insured For A Complete Safe Transaction. Very Fine Quality Big Sized Natural turquise PendantMade With 92.5 Sterling Silver .The Pendant is 100% Fit For Astrological Needs And Ideal For Those Who Are Recomended To Wear turquise Pendant . We take Extra Care For Astro Products So that Stone Touched The Body To Give its Full Effect And Fulfill Your Purpose . Very Fine Quality Big Sized Natural turquise Ring Made With 92.5 Sterling Silver .The Ring is 100% Fit For Astrological Needs And Ideal For Those Who Are Recomended To Wear turquise Ring. We take Extra Care For Astro Rings So that Stone Touched The Finger To Give its Full Effect And Fulfill Your Purpose . Exclusive Navratna Pendant Made With 92.5 Sterling Silver And Studded With Big Size 5x7 Ovals Of 7 Natural Gemstones And 1 BIg Pc Of Ruby In The Center With 7 Pcs Of Round Natural Diamonds. The Pendant Looks Awsome And Its 100% Fit For Astro Purpose. Fine Quality Red Coral Ring Exclusively Made For Astrological Needs. The Stone Touches The Finger And Gives You Full Effect If You Are Told To Wear A Coral By Any Astrologer. The Ring Is Made With Solid 18k Gold So That The Stone Never Falls Out As 18k Gold Is Much More Hard Than 22k Gold In Which Stone Can Fall Out Due To Regular Wear. Finest quality 4.5 carat natural certified yellow sapphire ring fit for astrological purpose made in 18k solid gold. the ring is made in such a manner that the stone will touch the finger to gve its full effect, and its a value for money deal. we offer 100% money back if you dont like it as we are 100% confident about our quality. A fine navratna ring which fulfill all the astro needsalong with fine desigining and awsome looks. The ring is studed with 9 precious stones including astunning piece of diamond. Total gemstone weight- 1.54cts (8 pcs) diamond weight- 0.11 cts (1 piece)gold weight- 7.180 gms (approx)gold purity- 18knote-as the item is completely handmade slight difference in weights can occur each time we make the item. Fine hand carved pearl ring made with 92. 5 sterling silver , fit for astrological purposes. The ring is studed with a fine quality of pearl weight approx 4. 00 cts. The ring has an elegant design and one can wear it for faishon purpose also. Fine hand-carved pearl ring made with 92. 5 sterling silver , fit for astrological purposes. The ring is studed with a fine quality of pearl weight approx 4. 00 cts. The ring has an elegant design and one can wear it for faishon purpose also. Excellent handmade 5 carat Bangkok (Thailand) Yellow Sapphire Ring Made With 18k Solid Gold Fit For Astrological Purpose . Yellow Sapphire Is lab Certified And It Can Be further Tested Anywhere On Earth. We Gurante For Authenticity For Lifetime.